For some children, their way into reading is not through love of story but rather through a particular interest, such as beetles, creatures or conservation. I recently had a client who was concerned about her son’s reading and begged me to find books on turtles – it was the only way in. For other children, their concern for their own future and the future of the planet is a key concern and although watching David Attenborough is fascinating and game changing – so is reading a book that teaches about conservation. My headline book this week is borne out of a fiction trilogy, although it very firmly sticks to the facts. 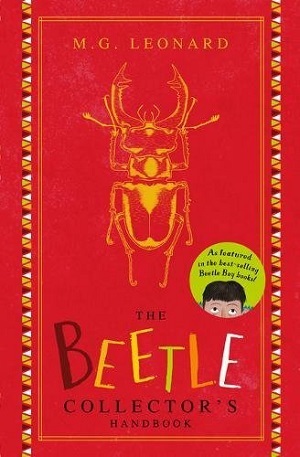 This is an excellent extension of a make-believe world, yet despite the fictional author named in the front and the Beetle Boy characters’ printed scrawlings in the margins, the book is above all a bonafide non-fiction book on beetles, comprehensively written by Leonard and fact checked by leading experts. For those unaware, the Beetle Boy trilogy is a great adventure story about Darkus Cuttle, in which beetles play a large role. This book, The Beetle Collector’s Handbook, is referenced within the text as a key non-fiction handbook, and now Leonard has created her fictional reference as a real book. Not only does it give further insight into the Beetle Boy characters with their margin annotations, but it gives detailed information on a selection of beetles, complete with annotated illustrations and rather wonderful tables and records of species. The illustrations show the actual size of some of the beetles, and the text supplies facts in a friendly, non-patronising and welcoming way. The author’s voice comes through loudly and clearly, not only in her (or his, if you go with the fictional author Monty G Leonard) explanation that this is a book for both genders, but also in her instructionals on how to catch, study, but mainly respect these insects. As one would expect from someone who views beetles as insect superheroes with their own costumes and skills, the book is enormous fun, and genuinely encourages the reader to seek out beetles – which luckily for most means simply going to a local garden or park, in which at least fifty different species live apparently. This is an inspirational book, but also highly researched, so that a child will come away with scintillating knowledge but also enthusiasm and enjoyment. The book is packaged in a chapter-book style to sit neatly on the shelf next to the fiction trilogy (if you so desire), but also with a nod to the fiction behind it – it’s hardback with foil embossed cover and pages inside that are tinted so that it feels ‘old’. Clever, attractive and necessary. Like beetles themselves. Add it to your collection here. 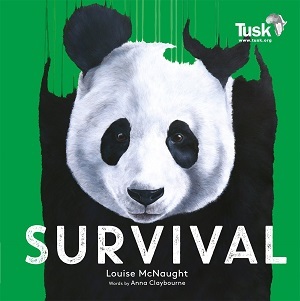 Survival by Louise McNaught and Anna Claybourne, and produced in association with Tusk, is a phenomenal visual warning about the plight of some of the planet’s endangered and vulnerable animals. Some of the artwork in the book is taken from Louise McNaught’s art show, also called Survival, and features the creatures’ energy – some are so stark they seem almost like photographs – but are hand painted with incredible detail. What’s more the animals are fading into or rather out of a bright background, so the image of the tiger looks as though the animal is emerging from the green foliage, at the same time as perhaps being gradually faded out by an invisibility cloak – or rather the threat of extinction. The book showcases each visual with a reference page that highlights the status of the animal (The Siberian Tiger is endangered) as well as giving key facts about population, Latin name, habitat and location in a small box. A paragraph of text gives context and illuminates the history but also conservation of the animal (action being taken to protect them), and their importance on Earth. The artwork in the book is breathtaking – quite inspirational. If you hadn’t already worried about the future of the Hawksbill Turtle, you will after seeing its vulnerability portrayed with the upward drips of paint around its vivid, striking body. Age 7+ years. You can buy it here. Turtles! When I spoke to that aforementioned client, there were only a few books around that met her son’s need. Now, there are more and more. 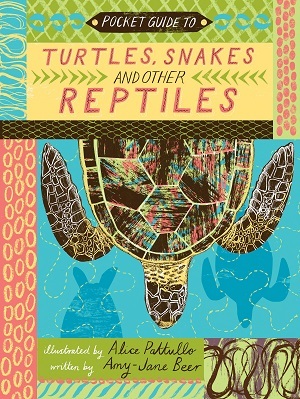 I’d start with Turtles, Snakes and other Reptiles by Alice Pattullo and Amy-Jane Beer. This pocket guide with high production quality gives a comprehensive look at all things reptile, despite being quite pocket-sized for a non-fiction title. Full colour illustrations throughout, and mentions for lesser-well known species make this an excellent guide to reptiles. Each creature is given an introductory paragraph but also panels including ‘A Closer Look’ and ‘Did you know’, Latin names and captions and annotations. For the older amongst us, some of the small text is hard to read against the dark coloured backgrounds, but for its readership, this is a fascinating and worthwhile little series, in conjunction with Britain’s Natural History Museum. Age 7+ years. You can buy it here. 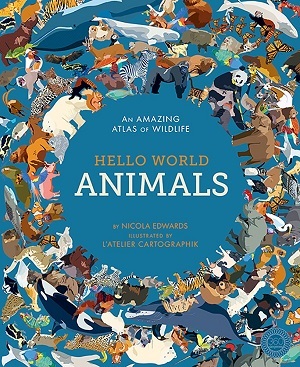 Three titles for younger children with an initial emerging interest in animals and seeking further understanding include Hello World: Animals by Nicola Edwards, illustrated by L’Atelier Cartographik. This companion piece to Hello World by Jonathan Litton is a novelty lift-the-flap title that explores the wonder and richness of the world around us. The book divides into the different continents, with maps overlaid by small images of animals, which when lifted give the name and a brief sentence. Brevity is of the essence here. I did enjoy the longer explanation as to where the European wilderness has gone, as well as the oddities of the Galapagos. The book features over 180 animals, pointing out when some are endangered, how some of them feed, and an interesting range of other facts – a good primer for primary school geography and exploration of the life sciences, and great for kids who like to dip into books to glean regurgitate-able facts. Age 7-9 years. You can buy it here. There’s a Rang Tan in my Bedroom is actually a 90 second animated film narrated by Emma Thompson, but Greenpeace have released an accompanying book, which tells the rhyming story of a baby orang-utan who is homeless because of deforestation – the clearing of natural habitat to make way for palm tree oil cultivation. Sadly, although they sent me a copy, I can’t find one for you to buy, but you can watch the video here. 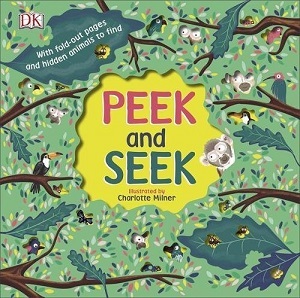 For a proper book, complete with flaps, full colour illustrations, and interactivity, little ones will like Peek and Seek by Charlotte Milner. At first appearance the spreads look empty – a landscape of houses, inhabitants silhouetted, and a tide of colourful trees behind. When the reader lifts the flap, a flock of birds and information appear as if by magic. The information describes roosting, group epithets, and migration, all on a hardy board book background. Further spreads include wolves, ants (although alliteration has won out over factual accuracy on this spread – using army rather than colony), fish, monkeys and rabbits: an eclectic mix with no apparent reason. There are also charts with things to find in the illustrations – a nice engaging bit of interactivity. A shame to find a spelling error on a key word in the factfile, but perhaps it will be picked up on reprinting. A gentle introduction for exploring eyes. Age 4+. You can buy it here. I do firmly believe that starting out with an agenda is not the best way to write a book, but often a cause or an issue catches our attention because of the story behind it. The media know this all too well – putting a human face to a crime, building a narrative around Brexit, giving story examples of health crises are the way we engage with issues. We need stories. These clever picture books may be issue-based, but they win over the reader with their subtle blend of picture and text, with their bold narratives. A skilful mix of tender illustrations and sparse text portray this issue with pathos and intelligence. Homeless people often feel invisible, and the gentle pencil sketching and sepia tones of this picture book lend an invisibility to the homeless man, but also give the book a sophistication and elegance that makes it attractive. The book starts with daylight and a girl rising from her bed within her house, but flits quickly to the homeless man also starting his day, in the rain and ignored. It portrays his struggle with hunger and cold, his awkwardness and shame, his loneliness. For much of the book, the people remain faceless – shown from waist down, or blurred in the rain. It is only at the end when there is human connection between the little girl and the homeless man, that the features begin to be defined. It is one act of human kindness that gives the homeless man the warmth and humanity to go to a shelter, and be recognised for who he is. 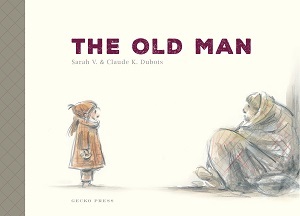 This is a brave and touching story, and an excellent picture book for allowing children to explore an issue and see that people are more than just their outward appearance. You can buy it here. This humorously illustrated story takes a look at domestic roles and the workload of a parent in a warm and engaging manner. The little girl of the story decides to act as ‘mummy’ to William, her stay-at-home Dad. She not only performs everyday tasks, but also sees his potential to be whatever he wants to be when he grows up. The reader will adore her attempts to look after him – making him breakfast but spilling the milk all over the table, giving him exercise by making him tow her up the hill on his bike, and generally ‘looking after’ him by making him push her in the swing, or take her round the supermarket in the trolley. Her grown up jobs include building blocks, and making tea for her toys. It’s a gorgeous portrayal of domestic life, with immense wit and warmth. In the end, the little girl decides that her Dad only wants one job, despite all the wonderful things he could achieve – and that, of course, is being her Dad. Uplifting and cute, and dominated with shades of blue, green and yellow – like a soft lamp casting a warm hue across the page. You can buy it here. Wenzel’s first picture book, They All Saw A Cat, took the perspective of the animal in viewing the world and illustrated each page accordingly. 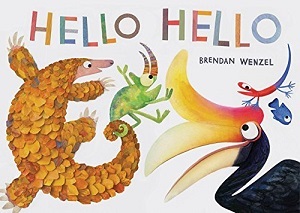 Hello Hello also gives animals shape and zest, showing the animal world in amazing variety – in colour, but also in action, with animals leaping, flying, twisting, turning and dancing across the white pages. Reminiscent of Lucy Cousin’s Hooray For Fish with its similar sparsity in rhyming text; the animals address each other with descriptive greetings: ‘Hello Stripes, Hello Spots, Hello Giant, Hello Not’. But Wenzel’s sparklingly colourful exploration of animal life takes the illustrations further by using a huge range of media including cut out paper shapes, oil pastel, computer graphic. The message is simple – that the animals all share certain traits, despite their vast differences. Many of the creatures featured are endangered and Wenzel lists the animals at the back, stating whether they are vulnerable or not. A vibrant call to action. You can buy it here. 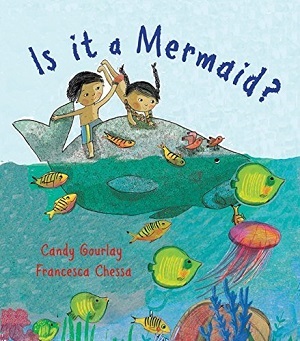 A tale of identity and imagination, in that Benji and Bel find a strange creature on their beach, and although they know it is a dugong, Bel goes along with the dugong’s story when she claims to be a mermaid. The humour lies in the illustrations, which represents the dugong as a fairly lumpen animal, about as far removed from mythical ideas of the mermaid as possible. When Benji’s negativity causes the dugong to cry, he realises he’s been insensitive, and plays along too. The illustrations are colourful, particularly of the undersea world, and beautifully atmospheric, especially in the change in light depending on time of day, but they also bear out a childlike simplicity. What’s more the children and the dugong are constantly active – so that the picture book feels alive and exuberant. At the end, the authors remind the reader that both dugongs and sea grass habitats are under threat, and give resources for how to help. Save the world here. 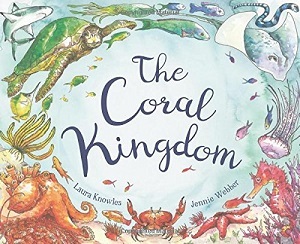 Through simple rhyme, this book manages to explore facts about the coral reef, portraying the colour, diversity and life cycle of the ecosystem. Each page has a simple sentence accompanied by the most detailed and colourful illustration. In this way the book both informs and inspires. There is much to take in – the dive of the dugong, homes of polyps, sea stars and mantas, turtles and minke whales. The colours and textures are plain to see, and the interweaving of the different creatures and plants make for quite a spectacle. The shock comes over halfway through, when the beautiful colours are gone – bleached by the warming seas. The remainder of the book explores what humans need to do to protect this environment, with a beautiful pull out spread of how it should be, accompanied by information about conservation on the reverse. From the winners of the Margaret Mallett Award for Children’s Non-Fiction, this is a perfect picture book to teach first steps to conservation. See the coral here. With a die-cut front cover, and lift the flaps throughout, this is a nifty book for young children about discovering nature. 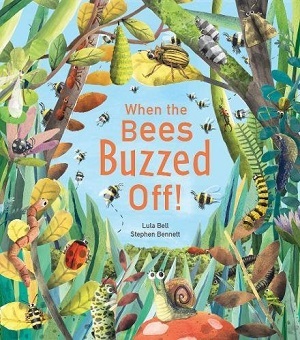 The insects inside the book are frantic that the bees have disappeared – told in an array of speech bubbles, accompanied by short narrative sentences. The authors have had fun here: the insects are imbued with personality, and pretentions of comic wit: “the search is fruit-ile” says one, a joke wasted on the very young but wry for the adult reader. Other jokes suit the readership better – the jealousy of tadpoles at different stages, the lying spider. In the end, the insects learn that bees need certain flowers to enable pollination, and without them our world would be poorer in many ways. You can buy it here. The other week, I featured How to Bee by Bren MacDibble as my book of the week. It’s a near-future fictional look at the plight of children in a world in which bees have been wiped out from pesticide use, with a stand-out protagonist in the shape of Peony, a farm child who longs to be a bee (a worker who manually pollinates the trees). Bren MacDibble kindly gave me some time and answered my many questions – the book itself throws up many topics of debate and is a fascinating study, as well as a bold and gripping novel. How To Bee is a phenomenal story set in the future after the loss of bees has caused an environmental disaster and famine. How did you come up with this idea? For a long time, I’ve been looking for a farm story (being a farm kid, write what you know and all that stuff), but I love fiction set in the future, so it came about pretty naturally after looking into food security and all the possible threats to our food supplies. Bees and their current plight are definitely worthy of a story, having worked alongside English crops for centuries, and their current situation being so dire. The future in the novel is fairly bleak, not only the environmental impact, but in terms of a massive divide between rich and poor, and a seeming lack of human rights/right to education/child protection. Did you set out to show this wealth divide for a reason? I see it happening all around us right now, so a future without it didn’t seem honest. When you have money there are so many ways to use that money to make more money, but the poverty trap is just that, a trap. Once you’re poor, there are so many barriers to getting work, to getting by, to getting ahead. So many people, and societal structures that tell you daily you’re worthless and stupid, adding your own lack of self-worth to the trap. Working for just enough money to keep working is another form of poverty. Maybe you feel safer, because you can buy enough to eat, and the clothes you need to keep working, and pay for the travel to the job that pays just enough to keep you employed. The poor and the working poor suffer first and suffer most in any catastrophe. Floods, fire, famine. Money, and the insurance it buys, is insulation that carries people through a catastrophe, but the poor don’t have that. They were struggling already to pay rent, to buy food, they didn’t have the funds to plan for the unexpected. That had to be shown if this was going to be an honest story. And I wanted this to be an honest story. In the novel, Peony, the main character, has a truly distinctive voice, which reflects her lack of schooling and her rural upbringing. Did you find writing the voice easy? Peony’s voice was so easy. She just got into my head. Her voice was full of the bravado of someone who has mastered her own small world, but also so simple and honest. There were a few elements I had to think about, like that fruit and flowers were precious in this new future so all good things like the children’s names, and the term ‘super-cherries’ had to celebrate fruit or flowers, also I wanted to set it in the future, but I needed them to still speak like farm kids. So it had to be futuristic with words like ‘diz’ for disrespect and ‘Urbs’ for city dwellers, but roughed up and full of farm terms like ‘go stomp yourself,’ which is how they get rid of pests in the future on farms with no pesticides. The rich people in the novel still have phones and computers and televisions, yet the poor people don’t at all. Do you see our use of technology dying out in the future, rather than extending communication between different people? In this future, young Esmeralda can play games on her fridge and in her room, and no doubt her parents use technology in their jobs much as we do, but there are so many poor in the post famine world, that I expected any technology they once owned would’ve been swapped/sold/pawned for food long ago. Electricity and internet fees would be further costs that could better go towards food and shelter. Maslow’s hierachy of needs does not have technology in the bottom layers. In the book’s acknowledgements, you mention that you wished the foreman on the farms had been as nice as you had made Boz, the foreman in the book. How many farms have you lived on and what was your experience? How did you use that experience to form How to Bee? There were about five farms between the ages of 7 and 17. On one, we lived in little more than a shed, surrounded by an electric fence and a chow chow paddock full of steers. I was alternately electrocuted and chased by young bulls, the bare wooden floor gave me splinters and the water chugged out of the taps brown. At the local school which had two classrooms and four kids in my year level, no one would talk to me because their parents owned land and we were the scruffy kids who lived in a shed in the chow chow paddock. The land owners certainly made it known that we were lesser beings. Whether they were swearing at us to round up sheep faster, or giving us a dressing down for stealing fruit from their orchards, we certainly got the impression that we were feral sub-beings who should just be quiet and behave. The last two farms were better, the land owners were nice, often had things to give away, and would invite us to use their pool on hot days. You also write school reading books. Is there a big difference between writing these stories and your novels? Is it more restrictive? I just write what I want, which doesn’t really fit with most publishers in the educational market, just those keen on humour, with fun series. Okay, mainly just one publisher, but their series are hugely popular and sell into the UK and US as well, so I’m very lucky to have found that one educational publisher that likes me. Mostly these are short concise stories and there’s not the room to be intensive with the characters, the way Peony is written. I’ve read that you have quite a bit of wanderlust. How does travel inform your writing? I think it’s built into me, this moving on thing. We moved around a lot when I was a child, I backpacked the world in my 20s, travelled across the US on motorbikes recently, and now I live in a bus. I think it does inform my writing because if you’re living how I’m living right now, which is with only the basics, you understand what you really need to get by. Travelling lets me meet a lot of people, see a lot of lives, hear a lot of accents, gather ideas, avoid the need for a full time job, and understand what it is a human really needs to be okay. What do you think has been the biggest influence on your writing? Reading. I read widely. I read all the time. I get upset that people think I have to read all the latest and greatest or all the classics because I need time to read all the obscure and wonderful too. It’s a terrible shame our lifetimes are too short to read everything. I read my favourite writers when they talk about what they do and I try to understand how they do it. So basically, finding authors I love, whatever the genre, and listening to their observations. Shoving it all into my head so I can understand how to do what I want to do, which is write with honesty and heart and really connect with readers. Are you excited to bring your novel to the UK? Do you think readers here see differently from those in your native Australia/New Zealand? Super excited. In Australia, the bees don’t have the varroa mite and deformed wing virus, yet. The bees are not suffering as much as they are in every other country. So there isn’t as much noise about saving bees as there is in the UK. I think people in the UK are more ready to see the importance of this book. Young readers in Australia and New Zealand have given me absolutely wonderful feedback about How to Bee, and I think young people in the UK will love it too. Peony’s way of talking is universal, being a future/country mash up rather than anything colloquial, and young UK ears will tune into it very quickly given their exposure to accents and slang. It’s been shortlisted/won six awards down under and it’d be super-cherries if it took off in the UK as well. Dry Running is almost done, and comes out this year in Australia. I have created another famine, this time caused by the death of all grass and grains due to a fungus (this was recently reported in Queensland, but I promise I’m not writing these things into existence!). A brother and sister have to escape the city and drive their dog cart, pulled by three Malamutes and two Huskies, 600 km to safety to reunite their family. Two kids, five big dogs, and a wide bare land to cross. It’s going to be an adventure! With huge thanks to Bren MacDibble for so patiently answering my questions. And I highly recommend How to Bee. You can buy it here. Recently, I’m seeing a great deal of science fiction that’s set in the very near future (mainly in adult fiction, but also in some children’s novels), as if we’re nearing our own dystopian landscape. But generally, this genre works well. It enables the author to envision a future not that different from the present, but tweaking elements to make a specific point. For the reader, it coaxes belief in this imagined world, in that there is a startling familiarity with specific things, despite the larger world being a little different. 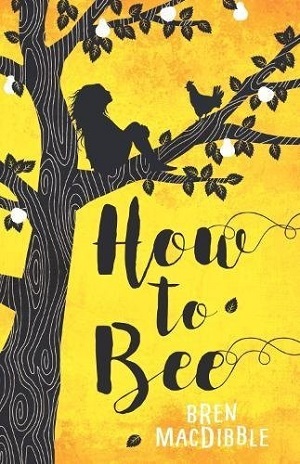 In How to Bee, Bren MacDibble goes with the premise that due to widespread use of pesticides, the bees have died out, and to continue growing produce and farming, pollination must be done by children (leaping from tree to tree with special pollinating wands). Based on real practises in Chinese provinces, where humans do actually hand-pollinate pear blossom, and her real-life experience of growing up on a farm, the book feels authentic and disturbing, yet ultimately hopeful. What shines most from this dazzlingly yellow book is MacDibble’s use of ‘voice’ to tell Peony’s story. Peony is nine years old, a worker on the farm, although not yet a Bee, because to be a Bee a child must be ten and awfully quick. She’s working towards it, but not quite there yet. Her voice, as she tells her story, feels new, fresh, lively, irrepressible but mainly fast, as if she’s scrabbling over the words as she would scrabble across the trees. The voice feels unschooled, unrestrictive, and matches her immense physicality. The play on words of the title sum up Peony’s whole existence. This is a girl bursting with life. She wants to be as much as she wants to bee. Of course, like all good novelists, MacDibble must throw obstacles in Peony’s way, and this is where things become dark and difficult. Peony is removed to the city, away from her beloved grandfather and little sister and farm, to work with her mother in one of the big city houses. The episode of her removal from the farm is fairly traumatic, and the two worlds – city and country – could not be more disparate. In fact MacDibble’s vision of the future is fairly bleak. Human rights are eroded – the children of the farm are broadcast ‘lessons’ on loudspeakers in the morning while they work – there is no universal right to education. Once in the city, Peony is a servant rather than merely staff – workers’ rights too seem to have been eroded. What’s more, there is unpoliced domestic abuse and cruelty to children. Poverty is widespread and there is no welfare system net in place. But for many children, they will not read into the bleakness of this. Peony’s move to the city is an adventure, and she swiftly makes friends with the girl of the house – Peony’s kind nature and selflessness shining through. And there is an uplifting ending with Peony’s love for family and nature winning the day. Mainly because Peony’s voice is so lively and uplifting, and her shining adoration for the farm, her immediate family and nature triumphs against everything dark and evil. The book is well paced – short sharp chapters, with quick forward movement like the bee pollinators themselves, the reader is propelled forwards on Peony’s adventure. The reader feels an enormous amount of empathy for this small child in a frightening world – having a more all-seeing terrain of her story than Peony does herself. For all its shortness, MacDibble breathes plenty of life into the book. There are complex dynamics between characters – particularly the mother/child bond, and also an unabashed look at inequalities in society. MacDibble writes with confidence and ease – the book feels different, atypical, which makes it shine brightly in the field of current children’s fiction. It turns out being is a complicated business, but with books such as this, children will buzz with excitement about their ability to influence their own futures. You can buy your copy here. I would suggest as 9+ years, but beware some of the darker episodes. Young teens who are reluctant readers will love the story’s depth whilst appreciating the brevity of the text. One of the wackiest, zaniest and most inventive books of the new year is this fun, silly, and outrageously colourful adventure from the author of Dennis the Menace books. The Nothing To See Here Hotel sits on the Brighton sea front, but it is enchanted and therefore invisible to the human eye (except for when a seagull flies into one of the invisible towers). Our narrator, busting with the same enthusiasm and energy of the author, is Frankie, one thirty-sixth troll, who lives in a world of magical creatures, and is descended from a long line of trolls, harpies, witches and puddle-nymphs. Told in a chatty, conversational style, this is an exuberant romp through a day in the life of the hotel, which is owned by Frankie’s parents. A goblin messenger arrives in quite a whirlwind, announcing the imminent arrival of the goblin prince. The hotel is excited, until they see the prince’s mammoth entourage (which reminded me of the entourage song in Disney’s Aladdin), and the stuck-up prince himself, who is hiding a little secret. The book moves fast – the characters are constantly in action, and Butler piles on the craziness, scene after scene. There is much unexpected plot, as it veers off in different directions, endlessly daft, weird and fun. Like Phil Earle with his Storey Street series, and Tom Fletcher in The Creakers, Butler weaves himself into the novel by playing with the role of author – exploring elements of story and congratulating the reader on reaching certain points. This is never patronising, but an extension of the fun and games Butler is clearly having with the text. He also invents new vocabulary, along the likes of Dahl, weaving in words such as ranciderous and squivelling. Each addition is exciting, fun and fits the story well. 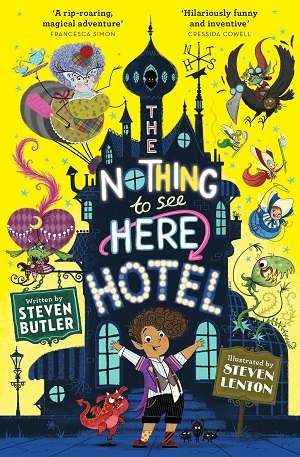 Hotels are also great fodder for literature – endless rooms, misfit characters, people away from home, and Butler makes full use of his imaginative Brighton resort. The final copy will be highly illustrated by Steven Lenton, but I received a very early review copy without illustrations. You can buy it here. Another cracking start to a series is this cartoon-based book about a new kind of superhero, a bee-boy. Melvin, by way of a touch of magical surrealism, falls into a bee’s hive that he’s tending, and is nominated protectorate from all anti-bee things by the bees. It may sound a little strange, but works brilliantly, as De Saulles, illustrator of the Horrible Science series, meshes together ideas of bullying and survival, in Melvin’s experience of school, and the bees’ experience of human and natural dangers. The parallel might seem extreme, but as Melvin battles with the horrific Norman Crudwell at school, so his bees battle against a myriad of menaces, from killer wasps to hawkmoths. Of course, De Saulles pulls in much ‘bee education’ in this fiction tale, but he manages to keep providing great sting and wit at the same time. 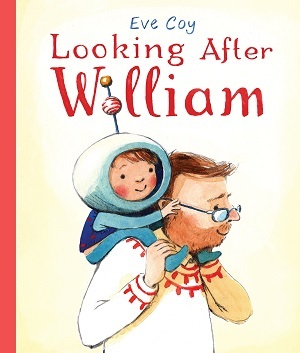 The reader will feel for Melvin as he overcomes his obstacles, but pathos is particularly evoked in the illustrations – Melvin has oversize glasses and sticking-out-teeth but manages to be presented as fairly adorable too. 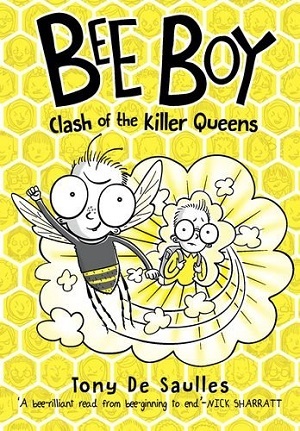 In fact, with the popularity of awkward cartoon-like heroes such as Tom Gates and Wimpy Kid, Bee Boy enters the fray as another contender for most gawky, and will win fans and readers. The book is simply full of illustrations, which gives a fabulous clue to each and every character. Most importantly, check out those endpapers. De Saulles has gone to town with his miniature depictions of Melvin’s classmates – imbuing each with an identity and personality. Lashings of fun, and a wonderful little crush on school friend Priti make this a buzzing read. You can buy it here. Will is taking part in a school project to paint a mural at the local zoo, but gets admonished for his creative use of colour. When he returns at night, he opens a portal into the land of the Night Zoo, where animals talk, and danger lurks. 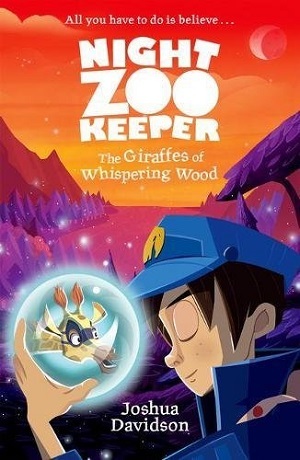 He makes friends with a giraffe called Sam, who explains that not only is Will the Night Zookeeper, but that he must keep the animals safe from the Voids – scarily destructive robotic spiders. This is a short, fantasy adventure story, with stunning black and white illustrations throughout, but it is also a jumping off point for children and teachers to explore an accompanying website, called NightZooKeeper.com with the idea to stimulate creative writing. A mix of animals, action, robots and a helping hand from a girl called Riya, the book ends on a cliff-hanger leading into the next story, publishing in August. It’s not ground-breaking storytelling, but my little testers liked it well enough. You can buy it here. Lastly, and by no means least, is what happens when a series for newly independent readers takes off (no pun intended). Dave Pigeon (Racer!) by Swapna Haddow, illustrated by Sheena Dempsey is the third title in the successful series about a couple of pigeons who talk their way through their adventures and demonstrate oodles of personality and pigeon wit. 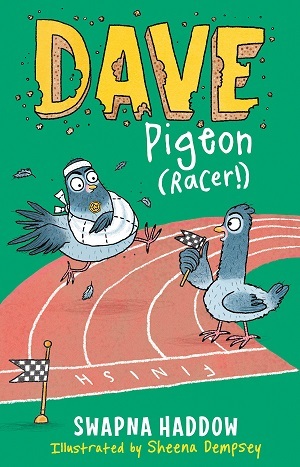 In this particular episode, Dave Pigeon is recovering at the vets, having had a prosthetic wing fixed, when he’s challenged to a race by a pirate bird. Playing on the idea of racing pigeons, and with allusions and jokes galore for adults as well as children, this is a sniggertastic read. With language puns, sparkling wit in both text and illustration, your newly independent reader couldn’t ask for more. Unless they want a fourth Dave Pigeon book? You can buy it here. As the days gradually get longer, and there’s the promise of new beginnings in the air, thoughts often turn to nature. Here are two new picture books that are positively brimming with the idea of spring and natural light, and both feature insects – one anthropomorphed as male, one female. 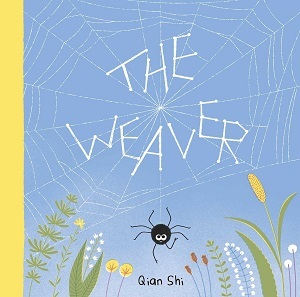 Just published this year, The Weaver is one of those special picture books that appeals to the very young with its tone, and yet transmits a message that is for all ages. Stanley the spider is born, and after catching a lift on the wind, starts to build a collection of precious things in his web. But unfortunately, the weather plays havoc with his plans, and blows away his possessions. It’s what he’s left with though, that really touches the heart. This is a powerful story, illustrated with clean simple lines and colours, which instructs us about the impact of memory. In a world in which we attempt to capture everything on a mobile phone, or through a lens, this is a great reminder that our brains are the best receptacle for what’s precious. Illustrated pitch perfectly, with a friendly spider who is almost cartoon-like in his demeanour, with expressive legs/arms that Shi has manipulated so that the reader sees the spider’s emotion through the shape of his body and placement of legs as well as his mouth. But it’s also the nature surrounding Stanley that works so well – the simple shapes of plants, the clever fading on the web for effect, and of course the shiny front cover. Just like Stanley’s collection of objects, this is a book that makes an impression on the memory and will last for some time. A great start to the year. You can buy it here. Another picture book for the very young, this too speaks to the reader, and even asks for interactivity, but there is more than just a simple story in this clever book. Florence is a firefly and she’s lost. The reader is asked to help her find her way home, but every time Florence sees a bright yellow light on the page, when the reader turns over, Florence is disappointed – it’s not the light she’s seeking. Once a moon, once a lighthouse, then a train, then city lights. None is the home Florence is looking for, and the author makes it very clear that the bright lights of the city are too bright for Florence. This light pollution is making wildlife lose its way. At last, there’s a happy ending and Florence is reunited with her family. The dazzling yellow in the illustrations works wonderfully – both in the way it shines through a hidden space, but also in the big reveals, when light spills from the top of the lighthouse, or dazzles the reader in the bright city. And Florence, as with Stanley, is endearing and rather human – in that her body language is expressive, her large eyes especially so. 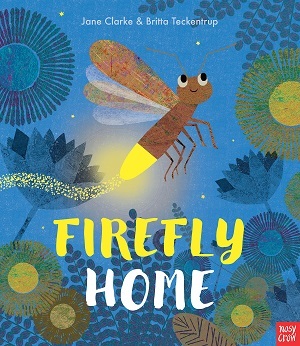 By the end, the reader will feel they had a part in helping the firefly, and will probably want to read all over again. Amazing colours in the blue of the sky, the yellow of the lights, and fantastically simple shapes of the buildings and flowers. You can buy it here. As part of my Back to School Blog in September, I recommended a title called Bugs by Simon Tyler. Simon is a graphic designer with a passion for presenting facts and information in an aesthetically pleasing way, and the book is certainly eye-catching. In 2013, Simon launched the acclaimed infographic poster brand Atomic Printworks, and to celebrate National Non-Fiction November, he writes for MinervaReads about the inspiration behind his graphic design, his love for facts and stats, and how it led to the publication of Bugs. My journey from small child with an interest in bright, bold computer graphics to the publication of Bugs started quite early on. I remember designing a Dr Who monster with a friend. We were about 10 years old, I think, so this would’ve been around 1987. We used an incredibly rudimentary computer programme, pretty much doing it one pixel at a time. We printed it out and sent it to the BBC. I think we were expecting to become internationally famous monster consultants. Predictably, this did not happen. Some years later, applying for university, I had convinced myself that I wanted to be a scientist, but soon after starting a degree in biochemistry at Imperial College, I realised I was absolutely not cut out for the process of actually doing science. I guess I was more interested in the idea of it, rather than the reality of highly involved lab experiments that went on for days and days. So, I moved to UCL to study the history and philosophy of science, which suited me far better. However, it did take a long time before I would put it to good use. I had got into graphic design, and one day I was idly messing around with some colours and shapes which became the first design – called the Deepest Trenches – for my poster company, Atomic Printworks. It suddenly occurred to me that there were all sorts of things that I could represent in a similar way. The idea being that kids would find the information presented interesting, and adults would actually want to hang up the designs around the house. One of my favourites is the Geological Timescale design – I think it succeeds in communicating the main message – how much time is involved, and how much has been packed into the most recent part of that history – whilst working as an attractive graphic object in its own right. My criticism of many other educational posters is that they tend to be covered in lengthy passages of text, which detracts from the explanation of the particular concept. I also wanted to avoid dumbing anything down. For example, when I was working on the Dinosaur Evolution design, I was amazed by how many of the full binomial Latin names my (at the time) three-year-old daughter and her friends knew. Thanks to TV programmes such as Octonauts, they’re already little experts. Ask an Octonauts fan about hydrothermal vents and prepare to be amazed! The publicity the posters received led to the Bugs book, which I wrote and illustrated for Pavilion. I wanted to apply the same design thinking – the clean, bold and colourful approach – alongside a depth of information that would interest and inspire a wide age range. I like the idea of kids’ books that adults get something out of too. I’m currently working on the sequel to Bugs – a book about the exploration of space, both in terms of space travel and visual exploration from Earth – astronomy – and that subject also lends itself very well to the wide-appeal approach. Bugs by Simon Tyler is out now, £14.99 hardback, published by Pavilion, and you can buy it here. The autumn always sees a mega haul of children’s nonfiction – the back to school collections, lists for National Non Fiction November, and of course the Christmas gift treasure troves. This year, unlike the wet harvest, has yielded a bumper crop. We start the day with maths. Always a slog after the long summer holidays, this book aims to reverse that groan with a rather wonderful premise – from the front cover, the reader is a genius: This Book Thinks You’re a Maths Genius, by Dr Mike Goldsmith, illustrated by Harriet Russell. It aims to prove that if the reader likes patterns, colouring and puzzles, then actually they’re good at maths. Taking basic mathematical concepts, such as geometry, measurements, statistics, and number patterns, it gives the reader activities and games to enhance their knowledge. Most pages have a ‘Where’s the Math’s box’ at the bottom to explain the ‘science’ behind the activity. It feels more heavily weighted towards shapes and patterns than basic numbers, but it was certainly fun to fill in. Geography next, with two books to explore. The first, Animazes, illustrated by Melissa Castrillon also combines the territory of activity book with non-fiction, as readers can trace the mazes on each page to learn about the migration patterns of different animals. There’s a vibrancy and exuberance to this book – set by the vivid colour palate, which lifts the knowledge from the page. Christmas Island red crabs, wildebeest of the Serengeti, Monarch butterflies, Mali elephants…There’s a wealth of phenomenal facts about these wonderful animals – for general use or project use. Maze answers are given at the back of the book. For those wanting a more straightforward factual book, Starters: Rainforests by Nick Pierce and illustrated by Jean Claude ticks the box for little ones. Basic layouts and colourful simple illustrations lend this a modern textbook look, and it reads plainly, but overall gives information in a neat concise visual way, with glossary, and index. Great for Key Stage One, and will bring a dazzling intensity of colour to the topic. 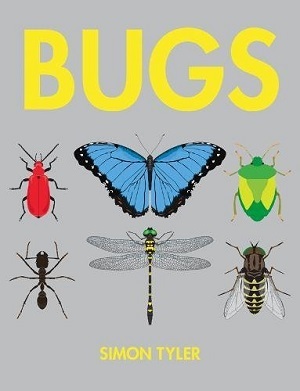 After break, it’s biology, using Bugs by Simon Tyler for budding entomologists. With the first 32 pages devoted to dissecting insect life – from anatomy to taxonomy, life cycle to senses, and the rest given to large colourful illustrations of individual species with accompanying small details about size and habitat, this is a comprehensive look at the subject. However, it stands apart with its impressive use of blank space on the page, clean lines, and coloured backgrounds, which all give the book both a vivacity and a clinical feel. Rarely have insects looked quite so engaging, it could almost double as a coffee-table splendour. Inspirational for children, a minibeast triumph. You can’t beat a good historical narrative for history lessons. Philip Ardagh’s new series sets out to dominate the market here with his ‘faction’ books, illustrated by Jamie Littler. The Secret Diary of John Drawbridge explores the life of a medieval knight with as much tongue-in-cheek humour as sword-in-hand fighting. Written in day-by-day diary form, with footnotes giving factual information or terminology, the next in the series is The Secret Diary of Jane Pinny, Victorian Housemaid. The Histronauts series aims to mash activity, story and non-fiction in its first two titles, An Egyptian Adventure and A Roman Adventure by Frances Durkin and Grace Cooke. A group of children dive back in time, and through the means of a comic strip, they illuminate facets of historical life. There are activities alongside the narrative, such as learning Roman numerals and how to play merellus, as well as mazes, recipes and a host of other factual information. Packed with detail, these are fun and educational. For a more visual look, try Unfolding Journeys: Secrets of the Nile by Stewart Ross and Vanina Starkoff. More cross-curricula than anything, this geography/history hybrid aims to explore this part of the world with a fold-out, vividly yellow map of the Nile (not to scale), highly captioned with number points, which are then extrapolated on the reverse of the fold-out. A mixture of ancient and modern facts and points of information make this a tricky landscape for a child to navigate – a few more dates might have helped, (and I’m unsure about the James Bond reference inside) but it’s certainly an intriguing way to look at a place of interest. After lunch, younger primary school children will be delighted to get their hands on Professor Astro Cat’s Solar System by Dr Dominic Walliman and Ben Newman. 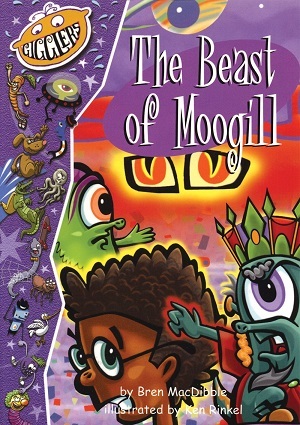 A new title in this series, but firmly aimed at a younger age group, this is another gem from publishers Flying Eye. Fantastic, familiar cartoons, accompanied by Professor Astro Cat’s chatty and informative dialogue, this would be my go-to book for teaching KS1 children about space for the first time. With our first day at school completed, we look forward to a trip out. The National Gallery have two phenomenal companion books to touring – Get Colouring with Katie by James Mayhew, and Picture This! By Paul Thurlby. The Katie books by James Mayhew have long been favourites for introducing the youngest children to art, and this is a great companion title that picks out paintings within the gallery and gives children space on the page to colour a detail in their own way. Katie gives hints and explanations along the way. Paul Thurlby’s spiral bound book explores more of the paintings by featuring a picture of them, and then a small explanation, with occasional questions to the readers. The paintings are grouped in different ways – both historical, but also those featuring children, times of day, fashions etc. It might be frustrating without a knowledge of which room each painting is in (which the book doesn’t give). But the questions it poses are pertinent and thoughtful. You can buy all these books from good local bookshops, or click the Waterstones link on the top left of the page. Braun made a huge splash with his first book, Wild Animals of the North, because of its gloriously large full-page imagery – and the fact that it was lovingly produced in a cloth-bound luscious hardback with images on uncoated paper. It felt and smelled worthy. This book serves to do the same with animals from the southern half of the globe: from the hot tropical rainforests of Brazil to the cold depths of Antarctica. The portraits dominate the information – so this is a visual treat rather than an information overload. In fact the text is pocket-sized against the largesse of the illustrations, which gives the animals themselves even more emphasis. The illustrations look tactile, and are highly textured and highly coloured. The artistry is stunning to behold – my favourite a troop of elephants headed directly in the reader’s direction – a backdrop of brown tones, blending with the grey to tea-coloured elephants – with just a suggestion of the dust flying up from their hooves in curvy waves. The colour is stunning – some animals blended into the background, such as the mantis, others, such as the little egret, standing out proud against its blue watery background. The scratchy illustration and reflections imply a watery feel. Information is scant, as in the first volume – for example, there is just a picture of the little egret with a naming caption, but text does accompany some – such as the Indian rhinoceros. Split into regions, there is also a thumbnail index at the rear. A book to inspire and delight for budding illustrators and graphic designers, and a must-buy for those stunned by the beauty of the natural world and who would appreciate that beauty mirrored in a book. You can buy it here. A book about baby animals for near babes, this is another visual treat from publisher Flying Eye. What’s stunning about these far more simplistic illustrations than those by Dieter Braun above, is that the eyes from each animal stare out of the illustration and pull the reader inside – almost like looking longingly into baby eyes yourself. The idea is that the baby animals need some protection before they’re ready to face the world, from chipmunks burrowing underground, to kangaroo joeys in comfy pouches. There’s nothing new here, but the information is given in rhyming couplets (some work better than others), and will surprise new readers who will not be aware that baby crocodiles hide inside their mothers’ mouths – not somewhere you’d expect to be that safe. A delightful start to learning about non-fiction, this is exactly the sort of book schools and parents want more of for their little ones who want stories, but also want facts. You can buy it here. How ironic! A chameleon who stands out. All the other chameleons change colour to match their surroundings of course, in this book that explains camouflage for the very young. Neon Leon, sadly, can’t turn off his neon glare to blend in. In fact, his fluorescent brilliant orange shows up even in the dark, and Leon soon feels sad and ostracised from the other chameleons. He searches for other animals who might also be bright orange, but as soon as he finds them, they fly away. Will Leon ever find his own happy place? This book works beautifully. Not only are the colours vivid and glowing, and the illustrations endearing and sympathetic, but the text speaks directly to the reader, provoking interactivity – helping Leon to choose the right colours, or what to do next. As with Safe and Sound, the book works wonderfully for young readers, giving non-fiction a new spin, but it also encourages massive affinity with the book, and the characters within. A great fluid read, bright and engaging. Purchase Leon here. Lastly, and by no means least, a wordless picture book that encompasses a tale of friendship with an environmental message, through fascinating and busy illustrations, telling the story in an almost comic book sequence, but with traditional drawings. A little girl in a bustling city is disturbed by a bee who accidentally flies in through her window. A natural reaction would be to swat the bee perhaps, or to capture it in a vessel so that it can be safely released. The girl does succumb to the latter, but when she sees it has drooped in its glass cage, she reads a book to work out what to do. What a clever girl! She revives the bee, and lets it go, but when bad weather drives it to her window again, a friendship is struck. Before long, the bee grows, and eventually teaches the little girl all about bees. The pictures are captivating – both in their execution and in what they’re saying. This is a wonderful way to engage young readers to get them to ‘say what they see’ – telling the story as the narrator, engaging their analytical and storytelling capacities, as well as their empathy. And the book also holds an environmental message about the importance of bees, and pollination. By the end, a kaleidoscope of new butterflies and flowers have emerged in the city. The book isn’t preachy though, but rather imbued with a grand sense of humour. From looking bedraggled to being pouffed with a hairdryer, our bee is full of personality. And the little girl too – she takes the bee out in her bike basket and gives it an ice-cream lolly, she measures it on a height chart, but best of all the bee enjoys a visit to the florist, and finally a day break from the city. A mellifluous read. Buy it here. I have been wondering about the ratio of children’s non-fiction books about animals, to children’s books about anything else. So many seem to feature animals – in the same way that picture books often use animals as a way of exploring human foibles, or pointing out the differences between humans and animals in a subconscious way. For children, animals can be the way into various topics – geography about where they live, how the food cycle works, our emotions and behaviour (through the differences and similarities with animals), the way we portray animals in art and photography, and the environment and how human behaviour affects it. Animals are an excellent frame of reference. After watching David Attenborough’s Planet Earth 2 with children, it’s easy to see how exciting animal life can be. From the illustrator of Horrible Histories comes this adorable non-fiction approbation to all the brilliant beasts that never quite make it into your average animal encyclopedia. Who needs further facts about flamingos or information about iguanas when you can read about the Lesser Fairy Armadillo, the Dagger-Toothed Flower Bat or the Yellow-Footed Rock-Wallaby? The latter is not a pop star wannabe, just a wallaby. Funny from the book’s dedication onwards, Brown separates the ‘celebrity animals’ we all know and love, such as the koala, from the animals featured in his book. Each creature receives a double page spread, with a large illustration and accompanying text and facts – size, eating, habitat, status etc. The text is informative, but also a cry for help – as some of them are endangered. Brown gives each illustration its own animal personality – with rolled eyes, or sneaky smiles or in the Gaur’s case, a death stare. This makes the book wonderfully amusing at the same time as hugely memorable and informative. I can definitely picture many eight year old children entertaining me with their facts about creatures who may sound made up, but actually exist. It’s telling that this was one of my review copy books that was appropriated by a child almost immediately. I learnt that a male lesser fairy armadillo is called a lister. (if you follow me on Facebook, you’ll see why that tickled me). Buy a copy here and have a good giggle. Although not purporting to do anything particularly new in the realms of children’s non-fiction, this is a particularly appealing book for the young non-fiction readership. It firmly places animals within their geography, teaching chosen facts about specific animals, as well as placing them within their habitats so that everything from common animals to more exotic, surprising species are highlighted. Each page is a different environment, from Desert to Fresh Water, for example, and species within the latter include the common frog and the kingfisher as well as the diving bell spider, which spends its whole life underwater. What’s particularly appealing is the 3D visual interactive features of each page – in Fresh Water, the common frog is bullet-pointed with facts about the tadpole-to-frog-story, but enhanced by the visual spinning wheel which illustrates each stage, complete with matching bulleted-numbers for easy reference. The page on the Hot Savannah features such beauties as the African thorn tree and the sociable weaver bird, but also encourages the reader to go on safari themselves, as hiding beneath the camouflaging grass illustration is information about the grass itself and the lion and zebra. One ostrich egg opens to reveal the number of hen eggs to which it is equivalent in size. Read the book to find out! Few readers will forget which pole is where, as the Arctic sits firmly on top of the Antarctic -the latter being portrayed upside down. The first page gives a quick guide introduction – explaining the definition of habitat, giving a key to the different types, and explaining the hemispheres, but all in very simple basic language that is easy to understand. Each page is a hardy cardboard, allowing for the 3D visual elements – such as the pop-up mountain, but also lending a longevity to this colourful, and thoughtfully put-together animal book. You can buy a copy here. The sort of children’s book that doubles as a coffee table manual, or a tome that could be smuggled under the duvet and inspire future generations of marine biologists. From the publishers of Botanicum, Animalium and Historium, comes a new scientific study in illustration – life beneath water. From rockpools along the shore, to the deepest depths of the ocean, Eleanor Taylor zooms in on fascinating sea dwellers to show the reader the intense beauty and incredible detail of a rarely photographed or illustrated world. Each page is given over to a different species, from the wondrous pygmy seahorse, ordinarily only 2 cm in size, here magnified to over 20 times, and in a glorious illustration that shows it clinging to its host sea fan by its tail. Text details are given alongside – from its size to Latin name, behaviour, habitat and other facts. The reader can look at even more minute creatures though, such as the 2 mm in size sea butterfly – a marine snail that uses its heart-shaped muscular foot as a pair of wings. Or perhaps, look at something larger, but under a microscope. Taylor illustrates fish gills as seen under a microscope – they look like feathers, or leaves from an exquisite tree. The book is split into sections – swimming from the Shallows, through Sea Forests, Coral Gardens and finally into the Deep. The use of background colour throughout the book reflects this, so that by the time the reader is studying creatures in the deepest part of the ocean, the book has turned almost black, yet with a grainy bubbles feeling, a swooshy watery sensation so that the pages almost look as if they are floating in water. The artworks are a combination of various forms including ink and charcoal, although coloured digitally, and the effect is quite mesmerising. Seeing images in such microscopic detail does make the reader think twice about what exactly it is they are looking at – zooming in at such an intensity magnifies the beauty. The text is informative, but also fairly descriptive – definitely aimed at a confident and learned reader. However, even the youngest sibling may be enamoured by the description and picture of ‘sea sparkle’, a single-celled organism that lights up the sea at night – otherwise known as ‘sea fire’ or ‘sea ghost’. Who wouldn’t be won over? This is very stunning-looking non-fiction book to inspire future generations and delight older ones. Age 8+ years. Buy your copy here. Doubling as an activity book and fact book, this is another non-fiction book in which the reader learns through play and fiction narrative. The fold out glossy cover flaps show panoramic artwork and creature spotting tick boxes to work through as the reader goes through the book. On the Trail of the Whale follows Otto the Octopus as he tries to find his best friend Hula the humpback whale, whilst Where is the Bear? follows Suki the hare looking to deliver a present to a bear called Ping. Both books allow the reader to traverse through particular landscapes spotting animals that live there, and finding out facts about them. The drawings are cartoon-like and colourful, appealing well to the target readership, children aged five and over. The instructions are rhyming, but the facts written clearly, as speech bubbles from the various creatures. The story nicely splits up the facts, so that there is plenty of movement on each page – the adventure doesn’t stop. There are even some maths problems lineated inside the book, asking the reader to work out numbers of legs and suchlike. Fun, bright, and following a simple narrative. Buy On the Trail of the Whale here and Where is the Bear? here. It may not feature the lesser fairy armadillo, but this is a fairly comprehensive look at the animals of the world, using computer-generated artworks to capture the variety of the animal world, and the details of each individual animal. Starting with the basic question of what is an animal, the book then breaks it down into classification and explores types of animals with sections on invertebrates, fish, amphibians, reptiles, birds and mammals – colour-coded for ease. Fully comprehensive, there is a scale for sizing, glossary, and a section on general animal science, including parenting and migration. As this is a DK encyclopedia, the text is accessible without being patronising. It’s not chatty but not too dry either. It feels like a hefty purchase, with a myriad of different ways of putting across information including factfiles, closeups, skeletons and diagrams. There is lots of white space, illustrations that are sharply annotated and labelled with captions that give oodles of information. The text is concisely edited, giving the maximum amount of information in the fewest words. The Galapagos tortoise double spread includes fact titbits such as the age it lives to, but also close up of growth rings, the armour plate, information on its bony carapace, its beak and rivalry, as well as the difference between its front and hind feet. Fully checked by the Smithsonian Institute, the book has also been rigorously looked at to suit the national curriculum up to Key Stage 3, covering components such as habitats and ecosystems as well as senses and respiration. What an incredible way to learn. You can purchase your copy here.